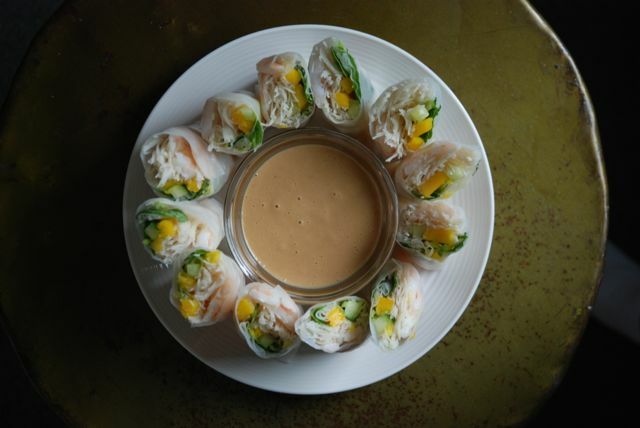 When ordering Thai, I only ever order fresh rolls when it’s warm out. Not like it’s a rule or anything, but they’re so cool and fresh I want nothing to do with them when I’m in the middle of my winter comfort food zone. What I’m saying is, it’s finally warm enough for fresh rolls! Flavour don’t come no fresher than this. 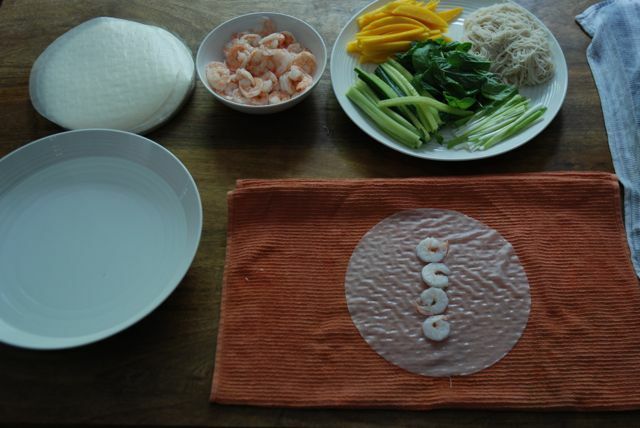 The prep work for fresh rolls is very simple albeit a little bit time consuming. 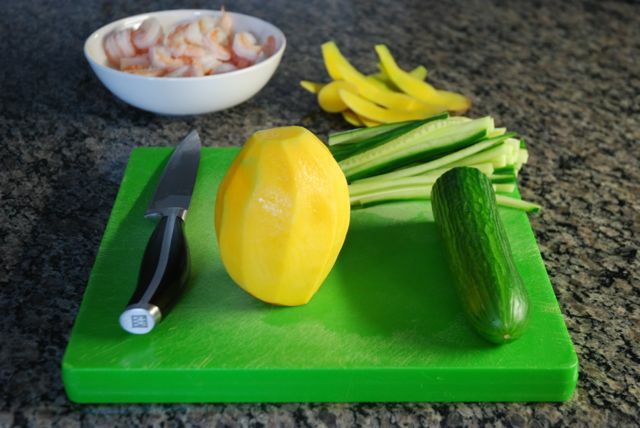 TOTALLY worth it though and it’s a good opportunity to brush up on those knife skills. 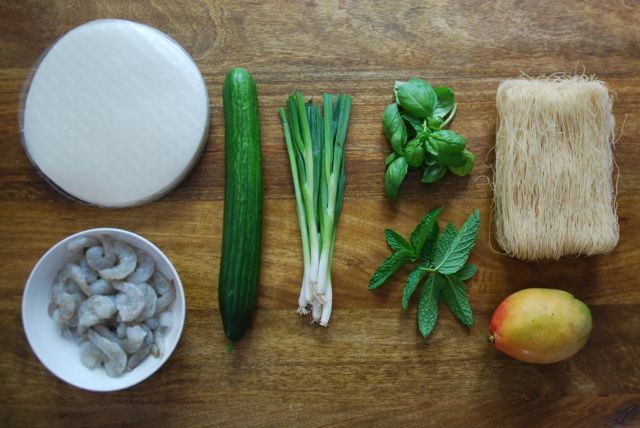 Simple fresh ingredients. Gorgeous. Gets me every time. Check out the photo tutorial…. These rolls are quite large and should be cut in half before serving. Serve them as an app or eat them for a meal in itself. The peanut sauce is sorta epic. Just a warning, you may want to chug it. 31-40 count shrimp means there are 31-40 shrimp in one pound. 1. Whisk all of the ingredients together in a bowl and set aside. 2. Bring a medium saucepan of water to a boil. Add shrimp and cook for about 90 seconds, until opaque. Drain and run under cold water. Pat dry with a paper towel. 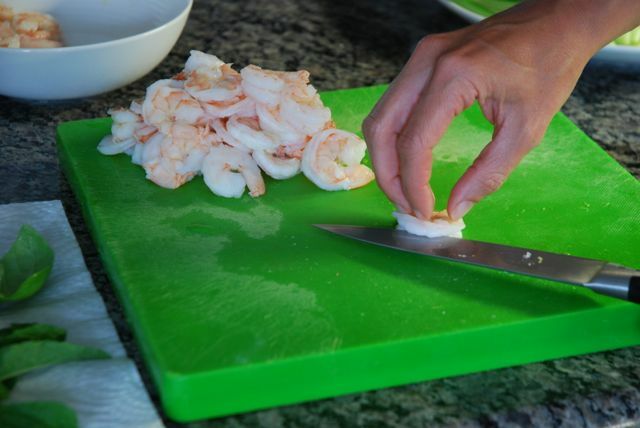 Cut each shrimp in half with a sharp knife. 3. Bring a medium pot of water to a boil. 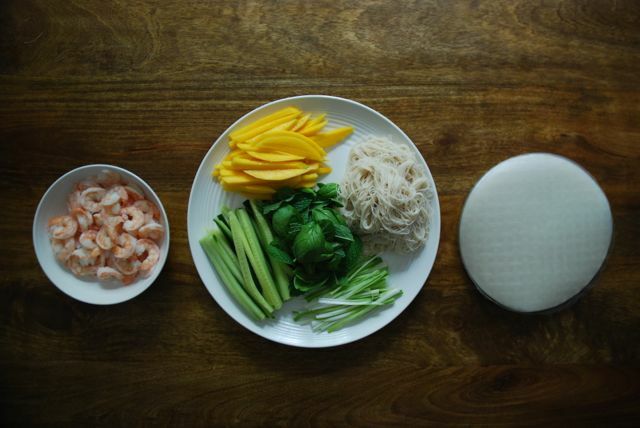 Remove from heat, add vermicelli noodles and allow to sit for 2 minutes. Drain and run under cold water to cool. 4. Arrange all of the ingredients on a large work surface. Place a clean kitchen towel on the work surface. 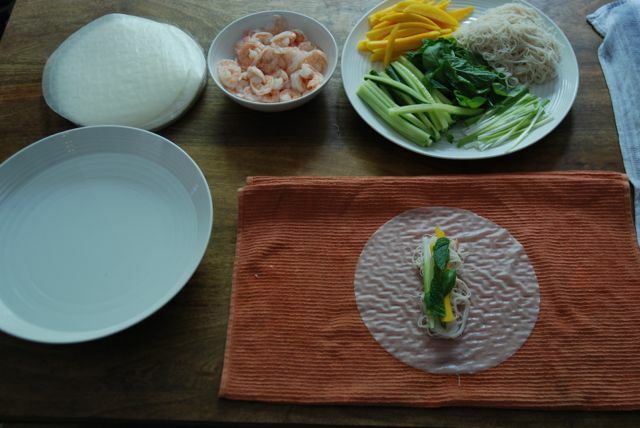 Fill a medium frying pan or wide, shallow dish large enough to hold the rice paper wrappers with hot tap water. Working with 1 wrapper at a time, completely submerge the wrapper until it is soft and pliable, about 15 seconds. Remove the wrapper from the water and place it on the towel. 5. 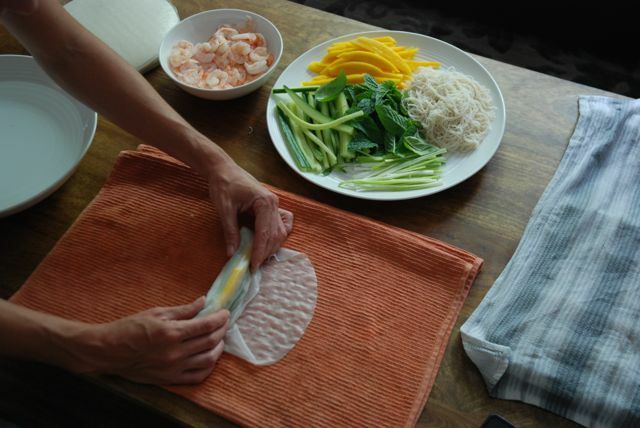 Working quickly, layer each of the ingredients in the centre of the rice paper wrapper leaving about 1.5 inches on either side. 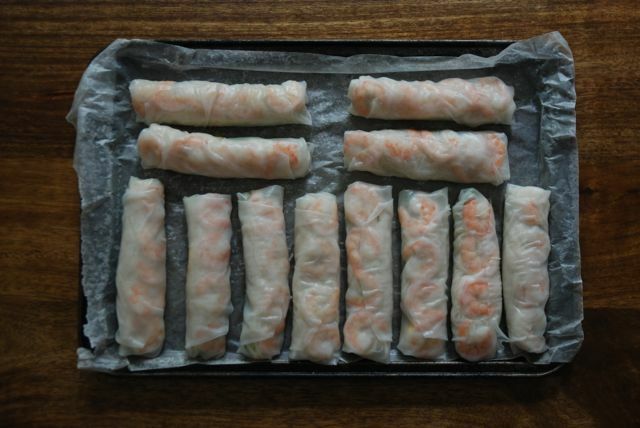 Fold each side over and roll the wrapper from one end to the other. 6. 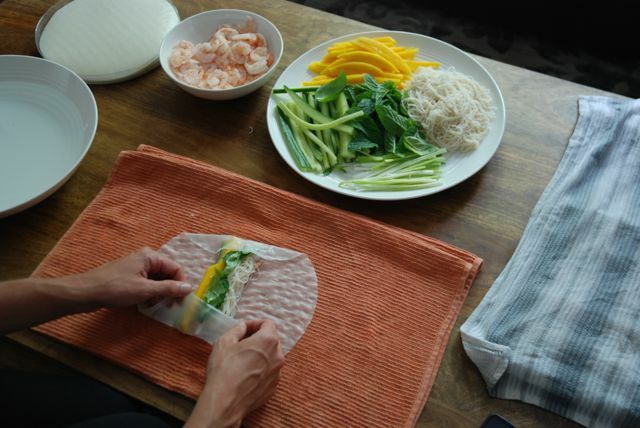 Place finished rolls on a parchment lined cookie sheet about ½" apart and cover with a clean damp towel or moistened paper towels while working. 7. These can be served immediately or made up to a day in advance. 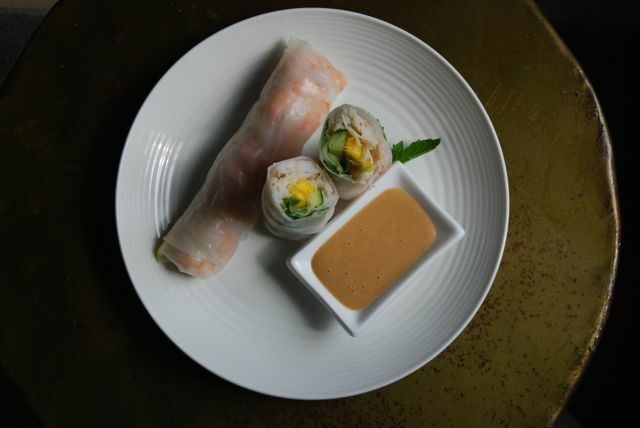 Be sure to cover the finished rolls with a damp towel or paper towels and plastic wrap tightly to keep moisture in.